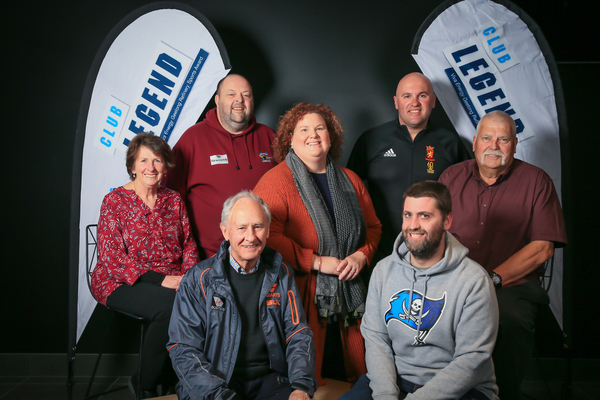 FINALISTS: Seven of the 20 Club Legend Award finalists Margaret Harry, Scott Smith, Christine Scott, Romeo Purlija and John Robert with, at front, John Biviano and Daniel Noonan. Twenty unsung sports heroes will win at least $1000 for themselves and their club after making the finals of Viva Energy’s Club Legend Award. The company’s refinery manager, Thys Heyns, congratulated the finalists this week on their contributions to local sport. “We’re proud to be part of a community made up of so many inspiring role models,” he said. Geelong Cats star and Club Legend ambassador Daniel Menzel was delighted with the “diverse and deserving group of finalists”. “It’s a huge buzz to see a large organisation like Viva Energy getting involved at a grassroots level by recognising the efforts of these unsung heroes,” he said. The awards offer $5000 each for the overall legend and their club. Other finalists win $1000 each for them and their club. Mr Heyns urged readers to inspect the finalists’ stories and pick “their most deserving sports legend” at clublegend.com.au when voting for the $2000 People’s Choice award opened today. This year’s 20 finalists are: Jim Rendevski, Peter White, John Beckworth, John Robert, Romeo Purlija, Sue Cormack, David Rea, Rod Smith, Daniel Noonan, Robert Malcolm, Margaret Harry, Geoff McDonald, Rohan Greaves, Jenny Fagan, John Biviano, Scott Smith, Sean Clark, Garry Birch, Alison Roberts-Wray and Christine Scott.